Hello everyone! 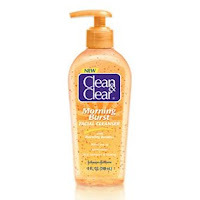 A couple of months ago, I used the Clean & Clear Morning Burst Facial Scrub and Moisturizing Lotion. I bought the products at Walmart for a few dollars each.. They were inexpensive. The facial scrub smelled really good, and I did like the bursting beads in it. The lotion, however, made my face sting. I kept on using the products for a few more days, and finally I realized I was allergic to them. Yeah.. I am not sure what exactly was going through my head when the lotion was burning so badly, and I continued using it. Ha ha. Anyways, I had a huge rash on my face, which went away in about a week. Well, a few days ago my cousin came into town. I decided to give her the Clean & Clear products, since I could not use them. And yes of course, I warned her. So, she loved the products! It's amazing how some people break out to some products while others do not. I guess I just have sensitve skin, but if you have used Clean & Clear products before and they worked well for you... then you may like it. They smell good (citrus) and they are inexpensive. My choice skin care system is Clinique. Stay tuned for that review!